hanges to a person’s nose can have a huge impact on how they look and feel. Because of this, it is especially important to be open with and work closely with your plastic surgeon during the consultation process. WHY MEN CHOOSE TO GO FOR RHINOPLASTY? Open procedure, where an incision is made across the columella, the narrow strip of tissue that separates the nostrils. During surgery, the nose skin is detached from its framework of bone and cartilage, and is then sculpted to the desired shape. These incisions in both the types help the soft tissues covering the nose to be gently raised, allowing the nasal bone structure to be reshaped. Any bump on the bridge is then removed with a subtle file to give a new shape. The nasal bones are then usually broken down and reset in a cautious way to allow them to meet in the middle to narrow the bridge line. Finally the tip of the nose is adjusted in size and shape to refine the nose shape, so that it matches the new profile. 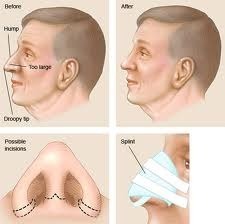 When the surgery is complete, small dissolvable stitches are made inside the nostrils and nasal dressings are inserted. Towards the end of the surgery, tampons are inserted in the nostrils and an external bandage (plaster) is applied by tape on the forehead and cheeks. This protects the position of the bones over the first week as they are set. The plaster cast is removed after about ten days. After the surgery you need to rest in bed with your head raised higher than your chest, to reduce bleeding and swelling. 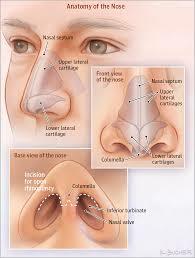 Your nose may be congested because of swelling or from the splints placed inside your nose during surgery. In most cases, the internal dressings remain in place for one to seven days after surgery. Your doctor also tapes a splint to your nose for protection and support. It’s usually in place for about one week.